Pop over to Tara’s post to add it to her linky too. I've seen this meme doing the rounds on the blogosphere and thought it looked like fun, so I asked Tall Daughter to draw a picture of me. Notice the slight roundness on the belly area? Well, she's been very kind to me that's all I'm saying. 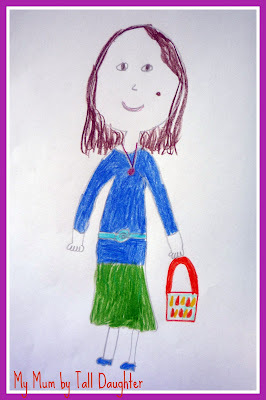 The big spot on my face is a mole, and she's even drawn my precious Orla Kiely bag. So, now you know what I look like. Say hello if you see me at this year's Cybermummy!